Just before Christmas I shared a selection of Christmas crafting projects from Springboard Supplies, and with Chinese New Year approaching on the 8th of February 2016 we've been having fun with some of their Chinese New Year themed crafting kits. Springboard Supplies are specialists in the supply of creative, educational resources to schools and other groups, and with their craft kits being sold in packs of 30 they are perfect for groups of children to work on together. 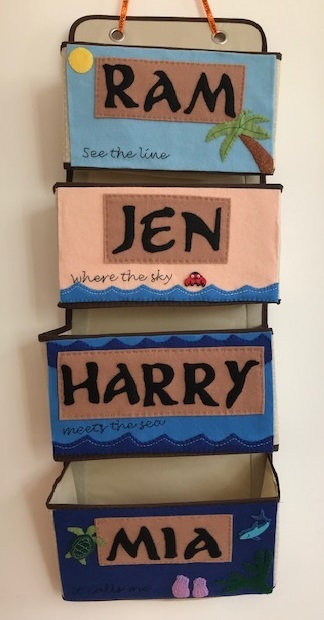 The kits contain everything that you need for a craft, and there is plenty of scope for customisation so that you don't end up with a collection of identical pieces. They are also simple to put together so that an adult can easily supervise a large group of children while they craft. We started with some Concertina Dragons. This is a nice, quiet craft, with quite a complex dragon head and tail that need to be coloured in, and both children spent a lot of time on this. 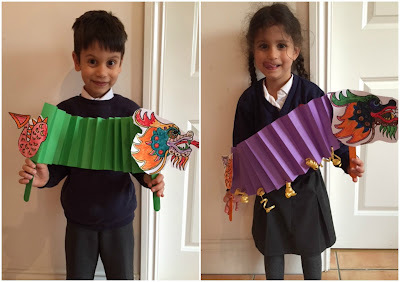 Then a long strip of paper is folded into a concertina, and when the head and tail are glued on and some sturdy lollipop sticks added for handles you have a brilliant dragon puppet that you can move around and play with. These would be great to perform a puppet show with a group of children and they could really customise their dragons to reflect their own creativity. Mia added streamers on to hers, and you could also decorate the concertina with glitter and sequins. 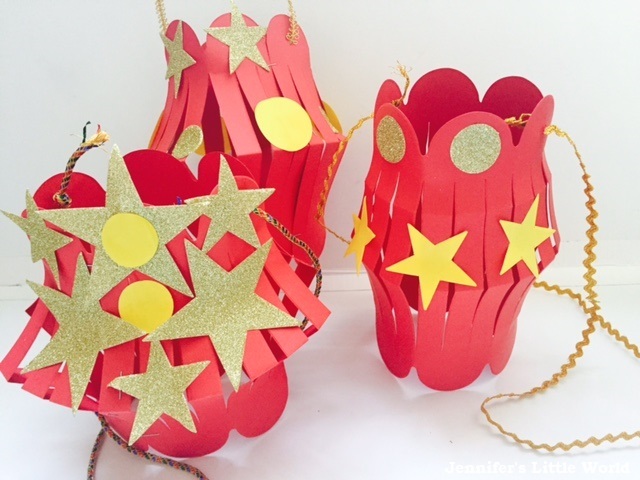 Next we made some cheerful Chinese New Year Lanterns. The kit itself is very simple, some pre-cut lanterns and shapes to stick on, and we were also sent some gorgeous gold patterned ribbons which we used for the handles. If you are making the lanterns from scratch they can be very fiddly to make, so it's brilliant to have them cut out already, especially if you were making them with a large group of children. You can fold the shape in different ways to create variations on the basic shape, and we made one each. They look lovely hung up around the house! The Dragon Spirals use the same dragon head and tail as the concertina dragons above, which are glued on to either end of a spiral and hung up with some string or ribbon. Mia loved making her spiral dragon and she waved it around the house before we hung it up. I remember when I was at school the teacher would often hang things that we'd made from the ceilings, and a ceiling full of these dragon spiral decorations would look amazing! Finally Mia and I made some Tactile Dragons. The kit comes with lots of pretty patterned and coloured strips of fabric that are threaded and knotted through holes in the cardboard dragon shapes. It makes a really fun dragon decoration, perfect for running around the house with. We had a lot of fun with these kits, and I think that they are brilliant for both larger and smaller groups of children crafting together. 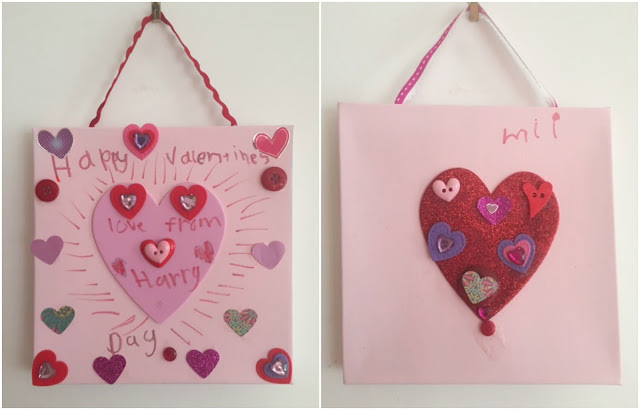 These products are all available from Springboard Supplies, and I received a selection of craft packs in exchange for this review. This week I've been enjoying completing a new puzzle from Ravensburger that I've been sent to review - The Inventor's Cupboard from Colin Thompson. I've reviewed a couple of other puzzles which use Colin Thompson's illustrations and enjoyed them very much, so I was very keen to see this one. His puzzles are beautiful, with lots of intricate detail. They can be a little daunting at first, because there are often no large blocks of colour or obvious ways to sort the pieces, but once you get started you quickly get to know the image and can begin to put the different areas together. I began the puzzle with the large white area at the top of the image which I thought would be the easiest place to start, but it ended up being more complicated than I expected and was actually where the last pieces of the jigsaw ended up! Instead I found it easier to concentrate on the bolder colours, like the reds and the yellows. Once I'd got going I found that it was quite straightforward to complete the puzzle, and it didn't take me too long. I really enjoyed searching through the box for particular pieces, or pulling out an interesting piece and finding where it went. It was definitely a puzzle which required constant reference to the finished picture, and it was really handy to have a separate copy of the illustration apart from the one on the box as then you can use both halves of the box to help sort out the pieces. If you enjoy challenging puzzles with lots of detail then this is definitely a puzzle for you! I have been lucky enough to review another couple of puzzles by Colin Thompson and you can find the reviews here - The Gardener's Cupboard and The Red Box. I received this jigsaw in exchange for a review. At the weekend I hosted a Minecraft birthday party for Harry and his friends. 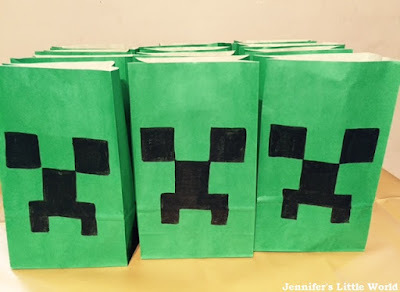 I was particularly pleased with the Minecraft themed party bags that I put together, so I thought that I'd share the details here. When I started looking around I found it difficult to find Minecraft related toys that were reasonably priced and suitable for putting in party bags. I was a little bit stumped as I really wanted themed bags, but with a bit of looking around on Pinterest I found and came up with some ideas that I think worked well. For the bags themselves I used green paper bags and drew a Creeper face on them using black marker pen. It's not my original idea, I'm afraid that I can't find an original source to credit for these as there are so many about. Then we made a few things to put inside. First I printed out some bookmarks which are made using a free bookmark printable. Unfortunately the ones that I used are no longer available but there are lots out there, for example these free Minecraft bookmarks which can be coloured and customised. Our printer is pretty basic, so I printed the foldable versions onto paper and laminated them. Then I punched a hole in the bottom and threaded through some co-ordinating ribbon. I didn't recognise all the characters, but Harry assured me that his friends would! I bought some cheap notebooks from Asda and printed out some Creeper faces. I glued these to a sheet of green card which I glued to the front of the notebook and then covered the whole thing with clear sticky backed plastic. I also added a black pencil in each which I also found in Asda. Another item that we made was our Hama bead Minecraft keyrings. I was super proud of these keyrings and I hope that they'll be appreciated by the recipients. Harry has had one on his book bag since we made them and it seems to have stood up well so hopefully they will be sturdy enough. I found some sheets of Minecraft puffy stickers on eBay which I thought were very good value. There were several available but I bought mine from this seller and they arrived promptly. I also added some McVities Gold Bars to represent the gold bars in the game. The sweet cones were the last thing that I put together, and again I was very pleased with them. I'd not tried making sweet cones before but it was a lot of fun and I think they look really good, I'll definitely be making more for parties in the future. I bought a pack of large clear cone cellophane bags and some green curling ribbon , then went on a hunt for green, black and brown coloured sweets. It wasn't as easy as I'd hoped and I found it difficult to judge quantities, but I got it pretty much spot on (I didn't fill the bags entirely as I didn't them to be too large). I made up 14 cones. For the green sweets I bought a 150g bag of green jelly beans . Black was more tricky, and I ended up with a 250g bag of blackberry and raspberry gums . I had intended to separate out the black ones, but I ended up putting the red ones in too to make sure that the bags were full. Finally most of the cone was filled with Aero Bubbles sweets - three packs of brown chocolate and three packs of mint which are half green and half brown - which were on special offer when I bought them at £1 a bag. On the front of the sweet cones I added one of the spare Minecraft stickers. Follow Jennifer Jain's board Minecraft Party on Pinterest. I am very pleased to announce that I have been chosen as a Bostik Blogger for another year! Every month I will receive a box of crafting goodies and some Bostik products, and be challenged to make a craft on a specific topic. This month the theme for the box is Valentine's Day, and I've been sent lots of lovely crafty bits and pieces. The box included some really pretty bits of coloured paper and ribbon, along with a couple of large foam heart stickers, and this inspired me to make some collage heart pictures as Valentine's Day decorations. First prepare the frame or background - we used pink paint. While the paint is drying, prepare your decorations. I have a heart punch which I used to cut small heart shapes from patterned paper and card, but you can easily cut them by hand or with a cutting machine. Gather everything together along with the adhesive. Then glue the embellishments to the picture frame. The children started with a large foam heart sticker in the middle and arranged the other decorations around it. Use plenty of glue, especially on the buttons. We found that the Bostik White Glu was perfect for the job. Wait until the picture is completely dry before touching it and everything will remain stuck down firmly. I had in mind a collage with lots of hearts all over it, but the children had other ideas and preferred a more sparse approach! Harry asked for a pen to write his message and so Mia wrote her name as well. Then make a hole in the top of the frame and thread through some ribbon to hang. I have the perfect spot right next to my desk! The box of craft materials was provided to me free of charge by Bostik as part of the Tots 100/Bostik Craft Bloggers Club. Amazon links are affiliate. For Christmas, Ram bought me a Kindle Paperwhite . It was a surprise present, because I already had a Kindle, but a very welcome present, because the Kindle that I have is one of the very early ones. Not quite a first edition but very close, with the old keyboard at the bottom. Although I do still enjoy reading a real paperback, I've loved my Kindle over the years. There are so many classic books that you can download for free, and if you keep an eye out for special offers you can also find new books for free or very cheap. I like that I can keep a selection of books to hand, depending on what I'm in the mood for, and it takes up much less space than a real book. But a few weeks before Christmas we were browsing child-free in a real bricks and mortar electronics shop, and I was whiling away a few minutes playing with the Paperwhite that they had out on display. I gave some positive feedback on it to Ram, and he was obviously paying attention! I hadn't really noticed how clunky my old Kindle has become. I don't know whether it's just showing its age, or if it's simply because technology has moved on so much. The Paperwhite is touchscreen, smaller in size and lighter, although the reading pane is wider and feels more natural to read from. It is a lot more responsive, the pages flick over quicker and the menu system is more intuitive. I also like the 'time left in chapter' feature, because I do missing being able to flip through pages to see how long is left until a chapter break. After Christmas Amazon had some of their bestsellers on special offer, and using digital vouchers that I built up in the run up to Christmas by choosing normal delivery instead of Prime I was able to stock up on my reading material for the year. Two books that I particularly enjoyed were The Husband's Secret by Liane Moriarty and The Last Letter from Your Lover by Jojo Moyes. Unfortunately they are full price again now, but it's worth keeping an eye out in case they go down again! I'm currently reading The Sisters by Claire Douglas which is also proving a very good read. All are books which are easy to pick up and put down around frequent interruptions with a plot that is interesting with a few twists, but not too complicated for me to follow! I don't like to set New Year's Resolutions because they are generally things that I'm working on anyway. I could always do with watching what I eat for a little while, especially after Christmas, and I try to exercise regularly and I'm also quite good at decluttering. So I thought that instead I would share my crafty plans for the year here, with the intention of finishing off some projects that I've had around for a while, as well as working on some new ones. My big project for the year is my Sky Blanket, which I've written about a couple of times already. Every day of the year I'll be looking to the sky at around the same time everyday, and crocheting a row of a blanket. It's early days yet but I'm loving taking part so far and I'm keeping it up to date, this is the blanket on day 6. This day marked a bit of a milestone for me in the project. I had planned to keep the blanket to simple blues and greys, perhaps an occasional white. But on the 5th January I saw two really beautiful rainbows in the sky and I really wanted to incorporate them somehow without making a whole rainbow stripe. So I used a little bit of rainbow ribbon and two dark grey buttons on either side, and I was really pleased with how it looks. It's given me a few more ideas for to I can reflect the sky in the blanket without it dominating the whole thing. I wanted to mark our family birthdays on the blanket, but again I didn't want to do a whole stripe in a different colour. So I think that I'm going to sew buttons and beads onto the blanket for a more subtle nod. I've also already lined up a pretty sparkly bead for a frosty day! Hopefully I won't want to add a border at the end! My other large project is my granny square crochet blanket. I've finished all the squares now, I reduced the number that I made as I decided that I wanted to have quite a large border. At the moment I'm sewing all the squares together which is proving to be very time consuming. Doing these two blankets has made me realise that although I really love the look of granny squares, when you make a blanket with them you spend more time sewing it all than you do crocheting! So I'll be very glad when it's all sewn together and I can start to work on the borders, which I think I'll enjoy more. I've nearly used up all the yarn that I had set aside for the project but luckily Make it Coats were very generous and sent me lots of yarn for my Sky Blanket so there will be plenty left over which I can use for the borders. If I have time after all that I really should finish off a pair of socks which I started knitting ages ago. I went through a phase of knitting socks and got quite good at it, for someone that has never really taken to knitting. I also have several balls of sock yarn in my stash which I'd like to use up. I've been putting it off because it's been so long since I last worked on them that I can't remember exactly how to do it, but I'm hoping that it will all come back to me if I get on with it. What are your crafty plans for the year? I'd love to hear them! For Day 1 of our London trip see here! We all slept well in the hotel, and it was probably the first time that we all slept in the same room and we weren't woken up by a small child or two at some point! We were still up early though, and so we headed first to Madame Tussauds. We arrived a few minutes before it opened so we were at the front of the queue and among the first visitors in. This was great as I remember it being very crowded in the past, and we were able to take some photos without it being too busy. A new attraction at Madame Tussauds is the Star Wars exhibit, where you can see figures in scenes from some iconic Star Wars moments. It wasn't too busy when we were there but I can see that when there are more people it would become a series of queues to take a photograph at each scene. Luckily we were able to take all the photos that we wanted to, and both children really loved this area. It was included in a visit with our Merlin passes but it said on a poster outside that you have to pay extra for it with some types of tickets which seems a bit cheeky. Exit was as always through the gift shop and this one was particularly bad, the only way out was via a till. Mia fell in love with a random stuffed thing while I was in the toilet, and it took quite an effort to get her out. We aren't completely mean parents though, and our next stop was Hamleys where we steered her towards some stuffed animals which were from the same range as ones that her friends have and also in the sale, much more appreciated and much better value for money! After a thorough look around Hamleys we had our lunch at Pizza Hut and planned the last few hours before our train left. Although the children have been to London a few times there were a few big sights that they hadn't yet seen, so we took them to see Nelson's Column and then finished with a stop at Buckingham Palace on the way back to the station. Harry was vaguely interested but Mia was absolutely enthralled by Buckingham Palace, and she stood outside the gates for ages looking in which is most unlike her. It must go along with the typical little girl princess obsession! And so with the Christmas holidays finished off in style, it was time to catch our train home, and return to the world of lunchboxes, book bags and school uniform. A few weeks ago, Ram found a cheap London Travelodge deal, and so we decided to spend the last couple of days of the Christmas holidays taking the children up to London. The day before we went we also purchased Merlin Annual Passes, so we had no shortage of things to do! We last had Merlin passes when Harry was tiny and had a lot of use from them even then, so now that both children are that bit older it seems like a good investment. It was also the first time that we'd attempted London with both children and no pushchair and it makes it so much easier to get around when you don't have a buggy to worry about! After travelling up nice and early, our first stop was at the Museum of London Docklands. It's free to visit, and there is an interactive play area for young children which operates on timed slots - you can book free tickets online the night before or collect a ticket from the main desk. The children had 45 minutes to play here which was just about right - there is a small soft play area for little ones and then lots of activities where you can load a cargo ship, play with pulleys, do some building with large bricks and so on. There is also a big water play area where you can send little boats down rivers to the sea which was probably their favourite area. Then we went to the new Shrek's Adventure, located on the South Bank near the London Eye. We booked a time slot earlier in the day, but it's worth noting that the time on your ticket is the time at which you can enter the main queue at the entrance, not the time that you will start the actual attraction. Once inside you still have to queue several more times (for a photo, for a lift, for another photo, for the buggy drop off window, for a welcome speech and so on) and it felt like the whole thing took a while to get going. But once you get into the first attraction, a magic 3D bus ride, the adventure moves along quickly with no more hanging around. You are divided into a group, there were about 30 people in ours, and then you travel between a series of rooms with a different adventure in each, all linked by a story involving Rumpelstiltskin and his witches. Each room is hosted by an actor dressed up as a character from the films or as an appropriate fairy tale character. The group was small enough that everyone could see, and children were encouraged to stand at the front for a good view. I must admit that I'm not a huge fan of the audience participation element so I spent most of the time trying to hide at the back, but the children enjoyed it! You aren't allowed to take any photographs as you go around, but at the end of the tour there is an area with different characters both from Shrek and the other Dreamworks films, and you can take your own photos here. You also have a photo book thrust upon you composed of pictures which they have taken of you with different backgrounds and characters, which I'm afraid we always avoid as they are so expensive! It was a great visit and the children enjoyed it very much. At 6 and 4 they were good ages to visit, old enough to walk around without any fussing or boredom but young enough to still enjoy the magic. It might be a little scary and intimidating for little ones in some places, but ours were fine as long as we were close by. A visit would have cost us around £100 which I do think is very expensive as a short one off attraction, although you can buy combined tickets with the other Merlin attractions or use an Annual Pass like we did which does make it better value. In the evening we had dinner at the Rainforest Cafe as a treat for the children (they also do a discount with the Merlin Pass!). Then after dinner we went back to the London Eye for a night time ride. Harry has been on it several times before, although he did suddenly have a fit of the wobbles and decide he didn't want to go on it, fortunately we managed to persuade him and he loved it! Although it had rained all day the evening was clear, and we had some lovely views. We walked for miles but the children managed brilliantly! I'll be posting about our second day later this week! Back in November I mentioned that I was going to start the New Year with a new craft project - a Sky Blanket. Embracing my new love of crochet and the fact that I've realised that I can actually crochet a blanket, I'm going to be looking at the sky every day this year and crocheting a row of a blanket in a corresponding colour. I'm very lucky that as a Make it Coats Ambassador they will be providing me with the yarn for the project. I'm going to be using Red Heart yarn, which comes in a gorgeous range of colours. I've made a start and it's been lovely to work with, it will make a nice thick blanket. Some of the other ladies taking part in the project have some fantastic ideas about different ways to incorporate the colours of the sky into their designs. For the time being I'm just going to stick with basic sky colours of blue and grey, but I may add extra colours as I go along. In particular I'm thinking about a different colour to represent our family on their birthdays. These are the main colours that I'll be using from the Red Heart Detroit collection. The light blue is Baby Blue, the mid blue is Azure and the darker blue is Airforce. The light grey is Mid Grey Melange and the dark grey is Anthracite Melange. I also have White, and if I need a less bright white I have some of the Patons Natural left over from my crochet Afghan. For my blanket I started with a 200 stitch chain, using the half treble (UK) stitch, the same stitch that I used for my crochet wreath. I prefer the look of treble stitches, but if I use those the blanket with its 366 rows will be enormous, so I think that a half treble is the way to go. I've not really crocheted in rows before so I'm going to need to be careful when it comes to the ends of rows, I do have a habit of either missing a stitch or adding a new one and I don't want to end up with wonky sides. For the last few weeks I've been making an effort to look up at the sky and think about what colour yarn I would use for that day. If there is some of the sky visible then I'll use the colour that best represents it, so for the sky below I would use my mid blue yarn. If the sky is entirely covered with clouds then I'll use the colour of the clouds, whether it's white, light grey or dark grey. The picture below would probably be dark grey. If there is a mix of colours then I'll have to decide the dominant colour. In the picture below I'd probably go for light grey. But if I've done something that has required spending a fair amount of time outdoors, for example if I've been for a run, then I might choose a sky colour that reflects what the sky looked like while I was outdoors appreciating it. I might even think about popping in colours for a sunrise or sunset if the sky was particularly beautiful. The trouble is that the weather in the UK is very changeable. The three photographs above were all taken within half an hour of each other! So I'm going to try and stick to the appearance of the sky around midday, about the time that I eat my lunch. If the sky is partially covered with clouds then I'll work out whether the clouds or the sky colour dominate. I must try not to get too hung up on it, as I don't want to be worrying about getting the exact colour of the sky correct each day. I'm also not intending to actually crochet a row each day as that's not always going to be possible. I will aim to be caught up at a minimum by the end of each month, and by the end of the year it would be brilliant if I was right on track to finish on New Year's Eve! And I'll definitely be sewing the ends in as I go along, I hate sewing in ends. I have another crochet blanket on the go as well, my granny square crochet blanket, which I am hoping to finish in the first half of the year. It's also in blues and cream, but I've tried to add in a bit more purple since I started thinking about the Sky Blanket so that it won't be too similar! I'm getting close to finishing the granny squares but sewing it all together is going to be a bit of a mission, so at least that won't be a problem for the Sky Blanket! There are lots of us taking part through the year and you can follow our progress using the hashtag #skyblanket2016. With thanks to the hosts for organising - Bug, Bird & Bee, The Boy and Me and You Little Sew and Sew.